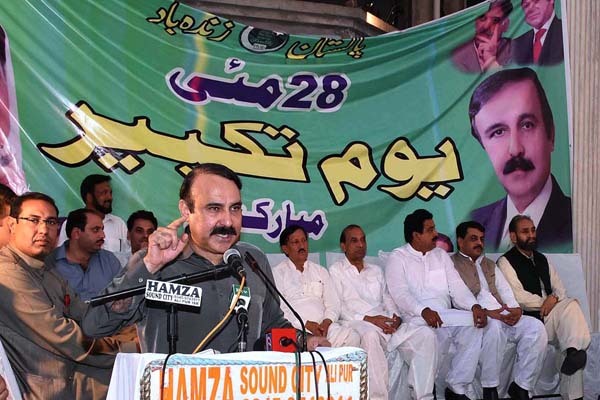 ISLAMABAD, May 28 (APP): Minister of State for Capital Administration and Development Division (CADD) Tariq Fazal Chaudhry Sunday said like nuclear power, credit would go to Prime Minister Muhammad Nawaz Sharif for making Pakistan an economic power. Addressing a function in connection with Youm-i-Takbeer here Chatta Bahktawar, he said on this day in 1998 Pakistan achieved a landmark success and conducted nuclear tests making the country the first nuclear power of the Islamic world. The minister felicitated the entire nation on Youm-i-Takbeer and start of the holy month of Ramazan. Pakistan though had been a victim of internal and external challenges, including terrorism, but it was now heading to become an Asian Tiger due to the PML-N government’s prudent policies, he added. Unfortunately, some ‘immature politicians’ were trying to push the country backward as they were resorting to the politics of protests and sit-ins, besides levelling baseless allegations against their opponents, he added. Tariq said all the international financial institutions had termed Pakistan a successful country. He paid tribute to all the patriot Pakistanis, who had rendered scarifices and made the country’s defence invincible. Similarly, Prime Minister Nawaz Sharif deserved appreciation for equipping Pakistan with nuclear capability, he added. Later, special prayers were offered for the progress and prosperity of the country, supremacy of the constitution, and eradication of terrorism.